Occasionally I channel my inner BrokeMillenial and get SUPER excited about saving on running gear. Let’s face it, running (as an action) is pretty much free…running gear is a whole different story! How many times have you walked into a running store or Sports Authority on a mission for running shoes and walked out with $300 in new gear? Guilty! That’s where my Road Runner Sports VIP membership comes in. I love the store in general 🙂 but their VIP family membership is something that we have been a part of for over 5 years now. At $24.99 a year it pays for itself (see my math below). For years my dad (a cyclist and triathlete) had a VIP family membership with Road Runner and I would simply check out with his code. But two years ago his expired and he did not renew it and I knew, standing at the checkout line with my new shoes in hand, that I would SAVE money by purchasing my own. So I did — and I have never looked back even though they rang a really loud bell and cheered when I bought it. 1) 10% off on ALL of your orders. Who does not love a deal? Do the math…a pair of Brooks costs about $130. So 10% off means $13 off your shoes. Considering Max and I go through about 2 pair a year each that’s a savings of approximately $52 a year in shoes alone! That MORE than pays off the cost of the membership. But the savings isn’t just for shoes. 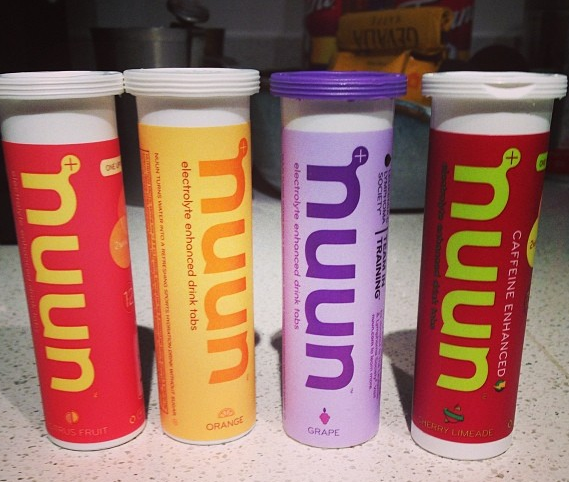 We got $2 off an achilles tendon strap, $0.13 off each Gu Gel pack, and they always have great deals on Nuun so we tend to try out new flavors often. Want more than 10% off, just keep an eye out for their special VIP events where VIP members get 20% off or have VIP-only sales. A few weeks ago I got my Brooks Ravenna 4’s for $80. Yup….$80! Those are $100+ shoes! 2) Free shipping on all of your orders. There are Road Runner Sports stores all over the country but they are not a HUGE chain (yet). I recommend the membership to everyone regardless of their location because they can order their shoes for free and return them if they are not right. Best choice: get fitted at a store near you and order them from Road Runner. Trust me….it’ll be cheaper! 3) 90 day “wear ’em & love ’em” guarantee. So you buy your shoes, they fit great in the store, and you head out on your first run and they just don’t feel right (too tight, shin splints, pain, causing you to pronate, etc.). At most stores that’s the end of the line for you…you are stuck with them because you have already worn them. Not Road Runner. You can put your miles on them and within 90 days return them for a FULL refund, no questions asked. Last month Mr. Husband read about a new pair of minimalist-like shoes called Under Armor Speed Forms. They were flashy and great (and we ordered them online via Road Runner) but he has achilles tendinitis and minimalist-like shoes were his worst enemy. We took them in today, got him back in a pair of Brooks, and returned the UA’s with the 90 day guarantee because of our VIP membership. We have one more week until our half marathon so we didn’t have a lot of time to mess around! We also love Under Armor (…one look at Max’s ALL Under Armor running outfits will tell you that) but these shoes were just not for him. 4) Their customer service is great and they are always attentive. Whether it is helping you get your shoes fitted via their Shoe Dog program (really cool! ), or helping you find new gear or food, they are they to help you. During last weeks races I developed 2 blisters on the back of my heels. One is smaller so I can ignore it 🙂 but the other…the other was nasty! I’ve got moleskin’s and gauze and band-aids on it but need something more for next weekends half. Our Finish Line Expert, Richard, told me about a pair of socks they used to sell that were created by WrightSock that were thin/multi-layer socks so that the friction stays between the sock and off of your feet. He dug around in the back, found the last pair in my size, and gave me a huge discount on the 3-pack (originally $32.99 but sold to me for $13.72 with my VIP discount combined with a clearance discount). I’ll be thanking Richard at the finish line of next weekends race! 5) They’ve got all the brands. Those fancy Under Armor shoes I spoke about above? We went to the Under Armor store and they didn’t even have a pair! Road Runner Sports did. Newton running shoes are another good example of running shoes that are specialized and hard to find. But yes, Road Runner Sports has them and even has “Newton Nights” where representatives come in to teach you about fore-foot running (sounds painful to me – but if you know more about it hit me up!). No, Road Runner did not pay me to write this post. I am just an excited customer who was really happy with my experience there today (and every time I walk into the store). My family loves this store and my dad was there earlier in the morning to stock up on Nuun and check out socks. 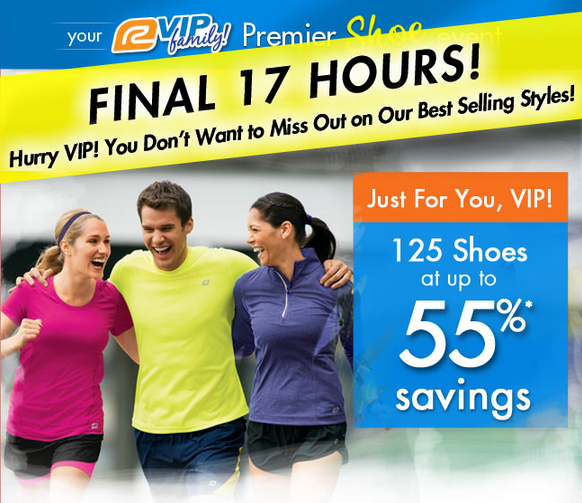 If you are serious about running you really should do yourself a favor and become a VIP member. It is worth every penny! I had my first shoe fitting there back in college and loved them! I stick to Charm City run now just because they’re big in the Baltimore area. And the Under Armour outlet in Gettysburg because Dad gets a 10% police/military discount! I’ve heard that Charm City Run is a great store as well! Don’t you love discounts? Especially on expensive running gear? I plan on raiding the Under Armor outlet on Black Friday – haha! Road Runner is really the best when it comes to running knowledge and gear. Their selection of shoes is probably the best I’ve seen (outside of somewhere crazy like Nike Town in Seattle) and their prices are competitive, if not better; and that’s before your VIP discount kicks in. Definitely somewhere that I’m more than happy to recommend to friends. Best running choice we made 😉 right up there behind signing up for a half marathon 13 days before the race 😉 haha. I am glad that you had a good experience with Road Runner Sports and their VIP membership. Comparatively, I have had a TERRIBLE experience with them. Hopefully it was just me! Oh no! Wow – so sad to hear that. We have had luck with the corporate and in-store service so far, but it is always sad to hear about a bad experience! I was there again last night and got great deals on a new running jacket. They are hard to beat!